Note about the name: Joe Rocket originally was going to call these jackets the Roadster jacket but decided mid-way through the manufacturing process that they liked the name Old School better. We’ve even seen some advertising where they called it the Speedway. Unfortunately some of the jackets have hanging tags that say Roadster. Rest assured, it’s the same jacket either way. Have a look at Joe Rocket’s sizing chart. We feel this size chart gives an accurate estimate of the overall size for this product. The jacket sleeves are solid leather (no stretch fabric panels) so there isn’t much “give” for more muscular arms, therefore, I would not recommend this jacket for those with larger-than-average arms. The Old School Leather Jacket from Joe Rocket has classic retro styling. The horizontal stripe across the chest and down each sleeve is a very classic styling feature. And the jacket does not have other racy styling features. 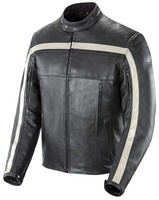 I’d recommend a jacket like this for cruiser riders or those that enjoy retro style bikes. In keeping with the “old school” theme, the jacket does not include armor and does not have provisions for any. But the leather used in the jacket is very thick and will do a great job with abrasion protection; in addition there is padding sewn in at the elbows and shoulders. The jacket has some zippered vents on the sleeves and on the chest and there are two zippered exhaust vents. Those vents will help flow some air in warmer weather. In cooler weather you can use the full-sleeved thermal liner for some insulation. Take the “View Larger Images” link above to see some good close-up pictures of this style and its features.